They are a tourist and architectural attraction. Yet there’s talk of tearing them down. 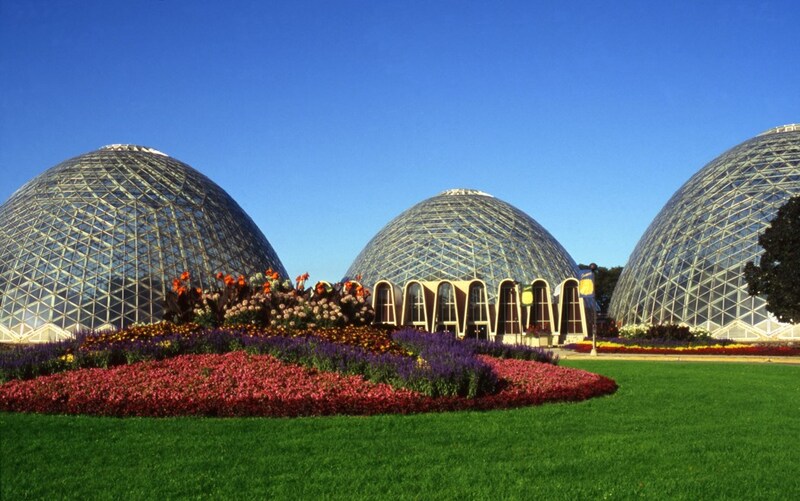 At last week’s public hearing about the Mitchell Park Horticultural Conservatory, Linda Carlson spoke about seeing articles on Milwaukee’s iconic “glass bubbles” while visiting Australia and Japan. 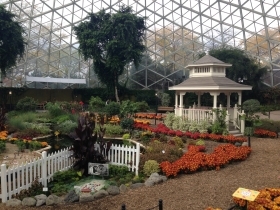 Both features, she noted, urged readers to try to experience the Domes, in one case if traveling “anywhere in the United States.” Carlson was among many citizens who pleaded that the county preserve the horticultural oasis. Few buildings ever become widely cherished or architectural icons. E-architect, a comprehensive website about worldwide architecture, lists the Domes among 10 significant Wisconsin buildings “that are either of top quality or interesting, or ideally both.” Others include “the Calatrava” at the Milwaukee Art Museum, Eero Saarinen’s War Memorial and four Frank Lloyd Wright projects. And the Domes’ appeal is not just highbrow. The Wisconsin State Journal’s Barry Adams wrote in 2013: “For many, the name requires little explanation and is part of the Wisconsin vernacular that also includes ‘The Pack,’ ‘brats,’ ‘Up North’ and ‘bubbler.’” PlanetWare, a “travel guide by experts,” lists the Domes as number seven among Milwaukee tourist attractions. 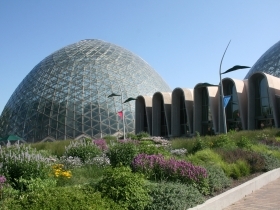 And Trip Advisor ranks the Domes 14th on the list of things to do in Milwaukee. Yet, despite their uniqueness and renown, the Domes may be within sights of a wrecking ball. County Executive Chris Abele has made it clear his administration is willing to consider razing them and starting over from scratch, depending on how county residents feel about it. All three glasshouses were closed on February 6, after a piece of chipped concrete was discovered in the Desert Dome in January. When Abele announced plans for a temporary fix to prevent further problems with the concrete-encased steel frames, he warned that permanent repairs or complete rebuilding could cost up to $71 million. He’s clearly pushing citizens to consider replacing the domes. More than 250 citizens attended the February 24 hearing hosted by the county board, and nearly all who spoke urged officials to save the Domes. Citizens called the Domes “a treasure,” “a community meeting place” and “the best classroom in Wisconsin.” Andy Andre said they help him stay sane during winter. Others spoke warmly of attending family-friendly New Year’s Eve celebrations, “Ghosts Under Glass,” holiday displays, concerts, ethnic festivals and the Winter Farmers Market. Roger Krawiecki, president of the 1,600-member Friends of the Domes, called them “magical” for people on dates, field trips and family outings, as well as for international students and those with special needs. Someone described enjoying the Domes from afar, when they’re lit up in the dark. Justin Bielinski, challenging incumbent Ald. Bob Donovan, whose district includes the Domes, has said he supports their restoration. Donovan, running both for mayor and alderman, has not weighed in. Deep-sixing the Domes would also contradict the current push to create compelling “destinations” with taxpayer subsidies. That buzzword has been applied recently to the proposed “Lakefront Gateway Plaza” and Couture streetcar terminal, and to the planned Bucks 4th Street entertainment center and pedestrian mall. 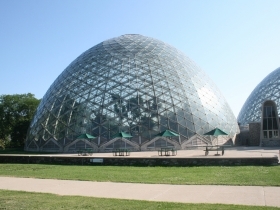 Folaron cited a historical precedent for a Domes do-over: “In the mid -1950s, the Victorian-styled 1898-built Mitchell Park Conservatory was deteriorating and public dialogue of replacement had begun.” The Journal Sentinel’s Chris Foran recently recapped that decline; long-deferred maintenance was a major cause. Foran noted a 1946 Milwaukee Journal story which reported that ”although the Mitchell Park conservatory was ‘probably the most frequented spot in the county park system,’ not much had been done to improve its condition since the county took over the park from the city in 1937.” After massive windstorm damage, the county razed it in 1955. Deferred maintenance is probably also the cause of the Domes decline. One glaring difference between then and now, though, is that the original conservatory, while impressive, was not architecturally unique. Rather, it was one of many showplace greenhouses created during the “golden age” of conservatory building. Many bit the dust. 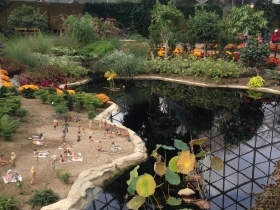 The “nation’s largest Victorian-era glasshouse,” is the New York Botanical Garden’s renowned Enid A. Haupt Conservatory. Built in 1902, it has undergone several renovations, most recently in 1997. The Show Dome is scheduled to reopen around May 1; officials hope the other two will reopen by fall. County officials have said “temporary” fixes to wrap concrete-covered steel frames with protective mesh could cost up to $1 million and last up to 10 years. That gives the community plenty of time to evaluate restoration options before talking about bulldozers and replacing the Domes. The process of determining what to do with Milwaukee’s most-lauded mid-century marvel will say much about how this community views its past—and its future. I have fond memories of regular visits with family (& grandma!) to the Domes in the 1960s-1970s. Maybe 1980s too. Visiting as an adult in the 1990s, my casual observation was that Conservatory standards were dropping: there was less permament plant material in all 3 Domes, and it was looking a little tawdry, but by the 2001s that downward slide was very obvious with wide open views in all three Domes stretching from wall to wall; mature plantings with height had clearly been removed and not replaced. 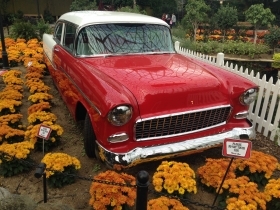 The Park’s event schedule, like the “… under Glass” events, were a great addition for a multi-purpose place that was desparate to keep its doors open, but not for a true Conservatory setting. Good work to the employees that have kept the old place running on it’s last legs, but the old school employees were probably spinning in their graves. Can the “Domes” be repaired/replaced and funded as a true “Conservatory” again, hopefully with a permanent endowment and free access? 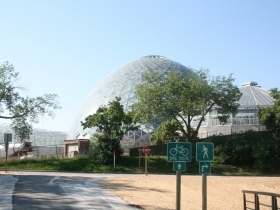 Chicago’s Lincoln Park Zoo and Conservatory (free) or Garfield Park Conservatory (fee?) are examples. A connected, but separate event space would be great. Johnson Controls a likely sponsor/funder. Or replace it with a giant ChuckECheese / Dandelion Park experience with lots of flower beds (well-maintained, please? ); a mixed use building that has a lot of bling like laser lighting, huge TV screens etc. Water pads and slides would be good too. Visit Navy Pier, Chicago. Likely sponsor/funder? Milwaukee County Parks. It’s much more sustainable and operationally efficient. We could build two of these for the same price as replacing the three Mitchell Park Domes AND increase the space. Let’s incorporate solar, geothermal and rainwater collection. Can we be more like the forward thinking Milwaukee that built the Domes in the first place and less like the current Milwaukee that is always looking to the past? How many people come to Domes every year? They are landmark and should have been fixed instead of an arena that will only have about 50 dates per year. They are poorly run and promoted. Sell them to private group for $1. Maybe the Potawatomi. Look what happened to the poorly ruin Pabst when Cudahy took it over. County does not run things well, Abele worse. Larson is going to bury the arrogant jerk. WCD, what does the arena have to do with the domes? But to answer your question, the Domes see about 200,000 people per year. And a correction for your post, the Arena sees about 160 events a year, not 50. Domes attendance has been steadily rising and the County reported it was 248,000 in 2015. The Domes have experienced a renaissance in recent years with all sorts of innovative year-round programming, including a winter weekly concert series, ethnic festivals, Winter Farmers Market, etc. It’s also much in demand for weddings (and wedding photos) and special events, including for corporate parties and conventions. Perhaps it could be even better marketed as a tourist destination, but few public facilities seem this beloved by people of all ages and backgrounds. It’s also a bit unusual for an architectural icon to be so loved by the masses, not just by architecture fans. WCD: The wonderful Pabst success is another whole story, and of which Milwaukee can also be proud.